For more information about the vehicle battery, seeBattery. Jump starting can be used on vehicles with run-down batteries by using jumper cablesand another vehicle. They contain acid that can burn you.They contain gas that can explode or ignite.They contain enough electricity to burn you. If you do not follow these steps exactly, some or all ofthese things can hurt you. Warning:Using an open flame near a battery can cause battery gas toexplode. People have been hurt doing this, and some have beenblinded. Use a flashlight if you need more light. Be sure the battery has enough water. You do not need to addwater to the battery installed in your new vehicle. But if abattery has filler caps, be sure the right amount of fluid isthere. If it is low, add water to take care of that first. If youdo not, explosive gas could be present. Battery fluid contains acid that can burn you. Do not get iton you. If you accidentally get it in your eyes or on your skin,flush the place with water and get medical help immediately. Be sure to use the following steps to do it safely. Ignoring these steps could resultin costly damage to the vehicle that would not be covered by the warranty. Trying to start the vehicle by pushing or pulling it will not work, and it could damagethe vehicle. Caution:If any accessories are left on or plugged in during the jump starting procedure, theycould be damaged. The repairs would not be covered by the vehicle warranty. Wheneverpossible, turn off or unplug all accessories on either vehicle when jump starting. Caution:If the jumper cables are connected or removed in the wrong order, electrical shortingmay occur and damage the vehicle. The repairs would not be covered by the vehiclewarranty. Always connect and remove the jumper cables in the correct order, makingsure that the cables do not touch each other or other metal. Remote Positive (+) TerminalRemote Negative (−) TerminalThe vehicle used to jump start must have 12-volt battery with a negative ground. Caution:If the other vehicle does not have a 12-volt system with a negative ground, both vehiclescan be damaged. Only use a vehicle that has a 12-volt system with a negative groundfor jump starting. The vehicles should be close enough for the jumper cables to reach, but the vehiclesshould not be touching. Touching could cause grounding and possible electrical systemdamage. Put both vehicles in P (Park) and set the parking brake firmly. Unplug accessories plugged into the cigarette lighter or the accessory power outlet.Turn off the radio and all lamps that are not needed. Turn off the ignition on bothvehicles.Locate the positive (+) and negative (−) terminals on both vehicles. Some vehicleshave remote jump starting terminals. Warning:An electric fan can start up even when the engine is notrunning and can injure you. Keep hands, clothing and tools awayfrom any underhood electric fan. 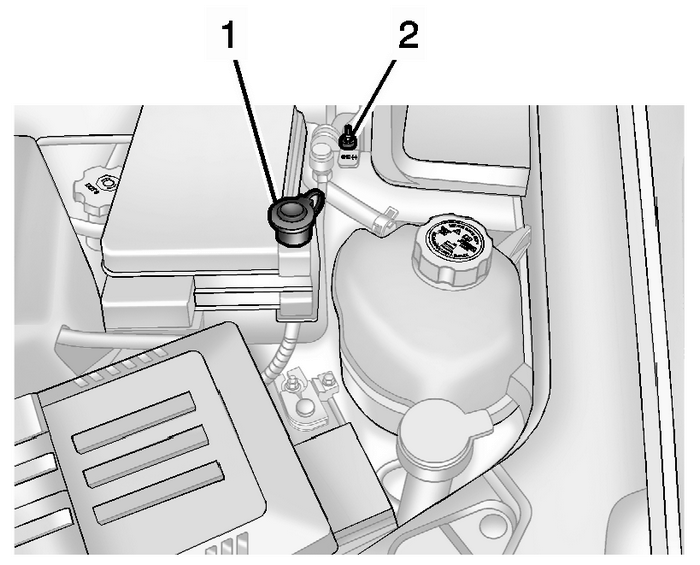 The remote positive (+) terminal (1) is located on the underhood fuse block, on thedriver side. Lift the red cap to uncover the terminal. The remote negative (−) terminal (2) is a stud behind the metal tab stamped with GND(−) near the driver side strut tower. The jumper cables should be in good working condition with no loose or missing insulation.The vehicles could be damaged if they are not.Connect the red positive (+) cable to the positive (+) terminal on the vehicle withthe dead battery. Use a remote positive (+) terminal if the vehicle has one.Do not let the other end touch metal. Connect it to the positive (+) terminal of thegood battery. Use a remote positive (+) terminal if the vehicle has one.Connect the black negative (−) cable to the negative (−) terminal of the good battery.Use a remote negative (−) terminal if the vehicle has one. Do not let the other end touch anything until the next step. The other end of thenegative (−) cable does not go to the dead battery. It goes to a heavy, unpaintedmetal engine part or to a remote negative (−) terminal on the vehicle with the deadbattery. Connect the other end of the negative (−) cable away from the dead battery, but notnear engine parts that move.Start the vehicle with the good battery and run the engine.Press the unlock symbol on the remote keyless entry transmitter to disarm the securitysystem, if equipped.Try to start the vehicle that had the dead battery. If it will not start after a fewtries, it needs service. Reverse the sequence exactly when removing the jumper cables.